It's that time again. To start thinking about Rausch Creek. Do we want the same dates? Also, we have to make reservations a little earlier so that we can get the two camping spots that face each other at the Jonestown KOA. Maybe Twinsticks will come this time. Last edited by RustyPW on Thu Dec 15, 2016 7:24 pm, edited 1 time in total. If you are coming. Copy and paste, add your name. 1. Russ, Chris, plus the furry kids, Cooper and Jake. I'd like to make it down. Depends on the dates for me. 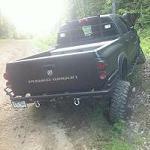 Need to know dates as I am going to need a month or so in the spring to rebuild my suspension on my truck. What dates work for you guys? For us it would have to be June 9th or later as the 2nd is STPR (Wellsboro, PA rally race) and my wife is a teacher.. But I'm the minority whom doesn't even own a PW yet, so please go with the majority vote. Copy and paste, add your name. [quote="pdavey"]Copy and paste, add your name. Depending on the dates I'd like to come down, probably just for 1 night. Got a buddy with a JKUL Rubi Hardrock who would come as well. He is a Nat Gaurd guy, so drill weekend may get in the way, and I travel for work, so no idea my travel schedule until a couple days in advance. Would a fairly stock 13 PW be alright through there? Do we have a firm date? Fairly stock would be fairly ok. There are a few places that get a little dicey, but careful placement of the rig will get you through. You will drag bottom (frame, sometimes a bumper). Yes, bigger tires and sliders would be a huge help, since you have a longer wheelbase than a 3G. Steps don't last long. But we don't put anyone intensionally in a position to wreck their truck. FirerescuePW wrote: Fairly stock would be fairly ok. There are a few places that get a little dicey, but careful placement of the rig will get you through. You will drag bottom (frame, sometimes a bumper). Yes, bigger tires and sliders would be a huge help, since you have a longer wheelbase than a 3G. Steps don't last long. But we don't put anyone intensionally in a position to wreck their truck. Alright. I'm on 35" Toyo C/T's, not M/T's, but they're alright. Once I wear these out, which might be in time for Rausch Creek, I'll be going with Thuren arms and 37's. Don't really want to lift the truck... Dogs have a hard enough time getting in now, and I don't want to have to lift the 60# or 105# into and out of the truck. That sounds so familiar! I "detached" my factory Mopar steps (yes, both of them) at Rausch one year. I bought WK sliders soon after that trip. For the dogs, I bought a telescopic ramp at PetSmart for ours. It sits perfectly on the sliders, and the mutt just walks up and in. She was having issues jumping at the truck and kinda bouncing off the door sill. No more! I'm down just need to know the dates. After June 15th and the kids may come, but I'm fine doing a solo trip again. Can't wait to go always have a blast. pdavey wrote: Copy and paste, add your name. Does June 23-25 work for everyone? The weekend before is Father's Day, and the following weekend is June 30-July 2. FirerescuePW wrote: Does June 23-25 work for everyone? And how does the Newer Power Wagon handle Moab? I am curious and plan to be there this year. Some time post July.